Real Porsche Speedsters - the 356-based kind - can these days go for a quarter mil, or more. Today’s Nice Price or Crack Pipe custom 911 Speedster - strangely described in its ad title as an Outlaw - is asking a fraction of that, but is it cheap enough? Don’t you know that the bird is the word? According to yesterday’s poll, fully 60% of you not only know that, but are also are hep to anointing our Monday contender, Turbo Coupe with a Nice Price win. Papa oom mow mow to its seller for that result. Today however we’ll have a totally different car and associated tune. In fact, better get out the glockenspiel. Despite how venerated and dear Porsche’s early 911 has become, the simple fact of the matter is that wasn’t always the case. Because of that over the years a lot of people took to modifying the cars without regard to future generations’ interest in experiencing - and paying for - an original dealio. Today’s custom 1973 911 Dion Speedster is just such a case. Built by a company called Dion and the Belmonts Sportscars it is a fiberglass body kit that looks so ‘80s you’d half expect it to play the MTV intro every time you fire the damn thing up. This bad boy has been for sale for freaking ever, apparently by the same seller owing to the pictures - and yes I did notice the two sets of plates. Weird. Does it look like a traditional Speedster? Yeah, I guess, if you're into that sort of thing. The bodywork has that Frankenstein's assistant look to it, and the covered lights up front do give the nose a cleaner appearance than stock. The fact that the turn signals and tail lamps look like they were drawn on with Sharpie doesn't help though. Back when the car was stock - apparently pre-1992 - it was a fun-loving Targa. That frame-strengthening element however has been given the heave-ho, replaced by what is said in the ad to be either a tonneau cover or Haartz cloth lid. That snaps to a windscreen that has been dutifully chopped by 4 inches and leads back to a pair of retro-grade grilles on the engine cover. The doors must operate by poppers as there are no external handles to muck up the profile, while inside there's a pair of Recaro buckets in grey leather also missing their head restraints. Considering that omission emergency braking in traffic is NOT recommended. The rest of the interior appears to be stock early 911 which means limited ventilation and hand-cranked windows. Under the back bonnet things are a little more interesting, there being a 1990 twin-plug 3.6 in residence, fronted by a WEVO-built 915 gearbox. Huge Racing Dynamics wheels are wrapped in Pirelli P-Zero rubber fill the wheel wells. This is all the kind of stuff that's intended to jump out from the pages of a buff book and sure enough one of these beasts appeared on the cover of European Car - Formerly VW & Porsche. The seller says that he is a 71 year old guy who is thinning his herd. Having owned it since '89 he says he personally had the mods completed in '92, and since then has put 48,000 miles on the car. 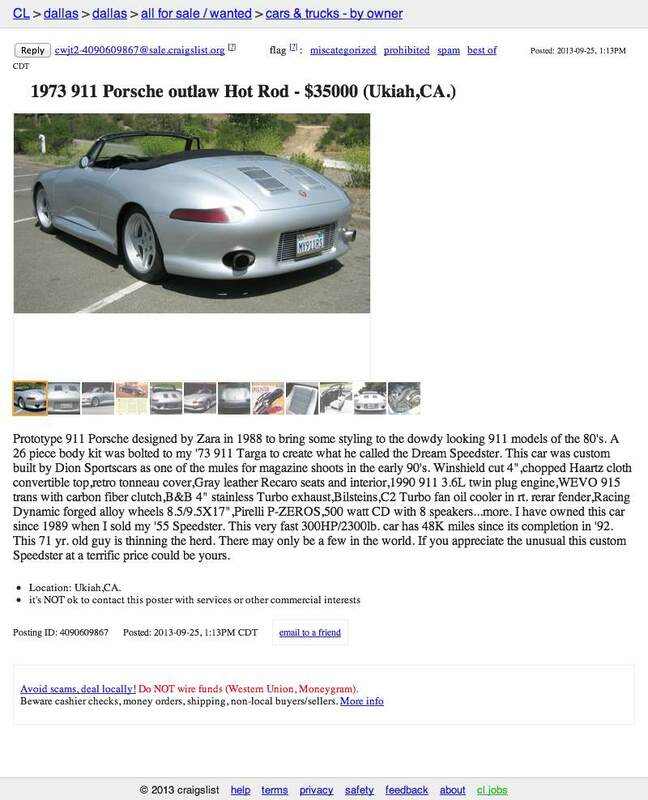 Like I noted earlier, the heard thinning has been going on for a while with this particular Porsche, and the price hasn't moved all that much. Right now, the asking is $35,000, which, depending on the model, might not be all that unexpected for a well sorted and bone stock '73 911 Targa. Yeah, a coupe might bring more but I've actually seen immaculately restored Targas from the era go for way more. This one is neither fish nor fowl, and it's now up to you to determine if its modifications add to, or detract from its value. 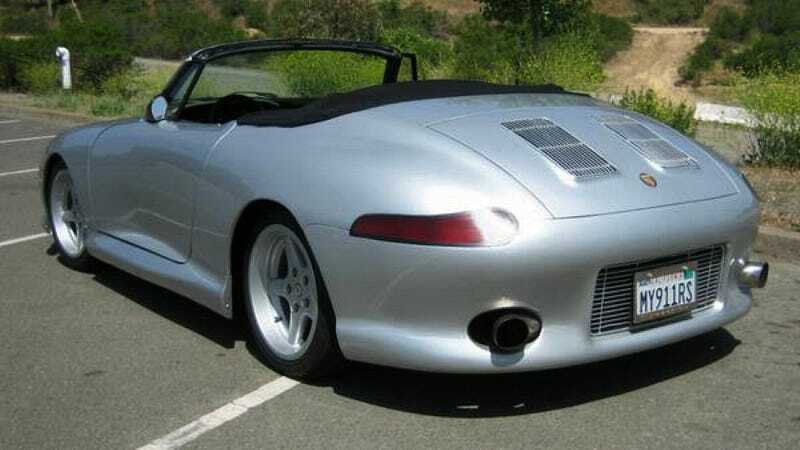 What do you think, is this custom Speedster worth $35,000? Or, does this 911's price have you dialing 9-1-1 to report a crime in progress? H/T to krautwagen for the hookup!